I’m sure that most of our readers, who are up-to-date about health issues, are aware that in addition to grouping blood as A, B, AB and O, they are further categorized into Rh groups, as Rh positive or Rh negative. But did you know that Rh negative mothers who have Rh positive babies experience a phenomenon that is called ‘Rh incompatibility’ during their pregnancy? This condition, while being uncommon, can give rise to potentially serious complications. Are you or someone you know Rh negative and is expecting to become pregnant in the near future? Stay Positive because we’ve got you covered. Health capsule decided to consult Dr. U.D.P. 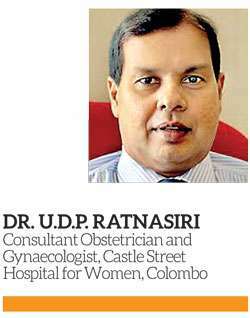 Ratnasiri, Consultant Obstetrician and Gynaecologist, Castle Street Hospital for Women, Colombo, to obtain more information on the subject. Everyone has a blood group which differs from person to person. In addition to the ABO group there is another group by the name of Rhesus. In this, the presence of a molecule called Rhesus factor in the blood cell gives Rh positivity and the absence of it is considered as Rh negative. A baby’s blood group is determined by both the mother and the father’s. So, even if the mother is Rh negative, the foetus has a chance of having Rh positive blood if the father is having Rh positive blood. In certain events called ‘sensitizing events’, the mother can get Rh positive blood cells from the foetus who is Rh positive. This will cause the Rh negative mother’s blood to identify the Rhesus factor as an enemy, developing antibodies to fight against and to destroy the Rhesus factor in the baby’s red cells. These antibodies can cross the placenta and cause destruction of Rh positive red cells in the baby, leading to anemia and other serious adverse effects to the foetus, sometimes even leading to miscarriage. 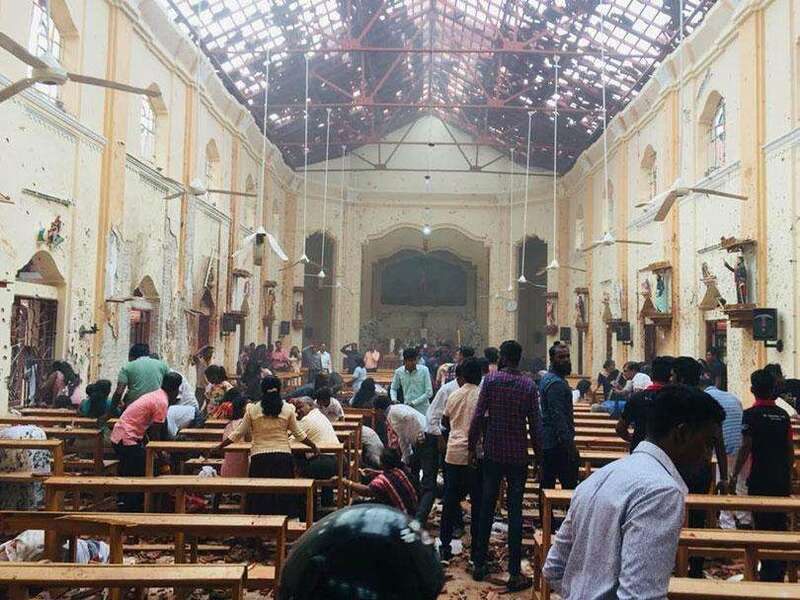 These series of events are known as ‘sensitization response’. As we discussed earlier, antibodies produced after a sensitizing event cross the placenta and destroy the foetal red cells in an Rh positive foetus. This in turn can lead to foetal anaemia which can cause serious consequences like miscarriage, stillbirth, foetal jaundice and brain damage. This is rare in a first time mother following the first sensitizing event. This usually happens in subsequent pregnancies with further sensitization. Do all Rh negative women who are having Rh positive babies develop these complications? Fortunately, this is not the case, as Dr. Rathnasiri explains. Red blood cells of the baby cannot directly enter the mother’s circulation due to the placenta which acts as a barrier. 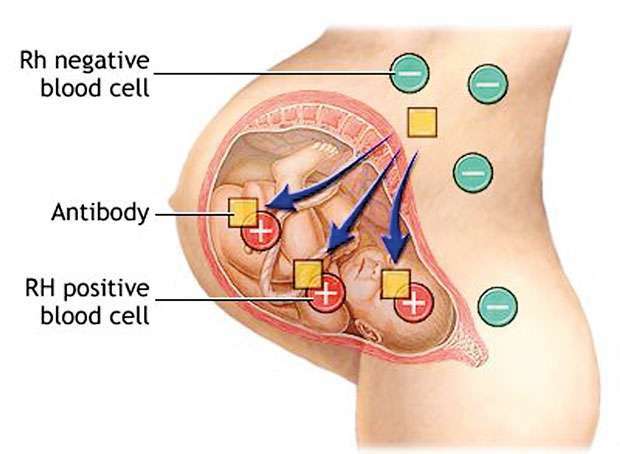 Sensitization occur when this barrier is breached due to some reason, causing Rh positive foetal blood gets in to the Rh negative mother’s blood. This can happen in the antenatal period or at delivery. Some events which might cause entering of foetal blood into mother’s circulation are trauma to the pregnant uterus, separation of the placenta with pregnancy and bleeding in early or late pregnancy. In addition, some of the intervention procedures like inserting a needle to the gravid womb to obtain fluid for investigations as well as placental separation at the time of delivery also can cause mixing of foetal blood with mother’s blood. So is there any way of identifying and preventing these risks to the baby? Indeed there are, according to Dr. Ratnasiri. All rhesus negative mothers are identified at their first clinic visit itself and their blood is tested for antibodies at different periods of pregnancy. Testing is usually done during early pregnancy as well as at 28 and 34 weeks of gestation. If the mother was found to have antibodies then further tests are carried out to identify the severity of the sensitization. The foetus is checked for the evidence of foetal anaemia with ultrasound examinations. An injection of a substance called anti D is given routinely as well as following a sensitizing event, in a Rh negative mother. This substance destroys the foetal red cells in mother’s blood, preventing the mother’s body from producing antibodies and damaging the foetus in the future. This injection is routinely given at 28 and 34 weeks of pregnancy and at delivery if the baby is rhesus positive. Some events where additional anti D are given are if there is an episode of vaginal bleeding during the pregnancy, and when invasive tests such as amniocentesis or chorionic villous sampling are performed. Women who have a miscarriage, an ectopic pregnancy or a termination of pregnancy will also need anti D, even if it is the first pregnancy, to protect future pregnancies. Sometimes a woman’s Rh antibody levels need to be measured periodically during her pregnancy to anticipate whether the baby might have problems. If her antibody levels are too high, then she might need further tests to check the health of the unborn baby. Sometimes the unborn baby needs a blood transfusion, or it might need one soon after birth. In developed countries, foetal blood testing is done with advanced facilities to identify the severity of foetal anaemia and consequences. Foetal blood transfusion is done while the baby is still in the womb itself. This is done to correct foetal anaemia and save the baby from further dangers which can come as a result of brain damage due to hypoxia. In the local setup, the foetus is delivered when the problem is detected with the level of severity and foetal blood transfusion is given to correct anemia and to prevent deposition of bilirubin in the foetal brain leading to long term brain damage. Giving birth to a new life is anyway a challenging task which will be made even trickier by the added potential complications. But as with many health issues, being informed beforehand, which enables us to seek medical care at the correct time, can lead to a successful pregnancy with minimal stresses and ensuring the effective delivery of a healthy baby in the end.